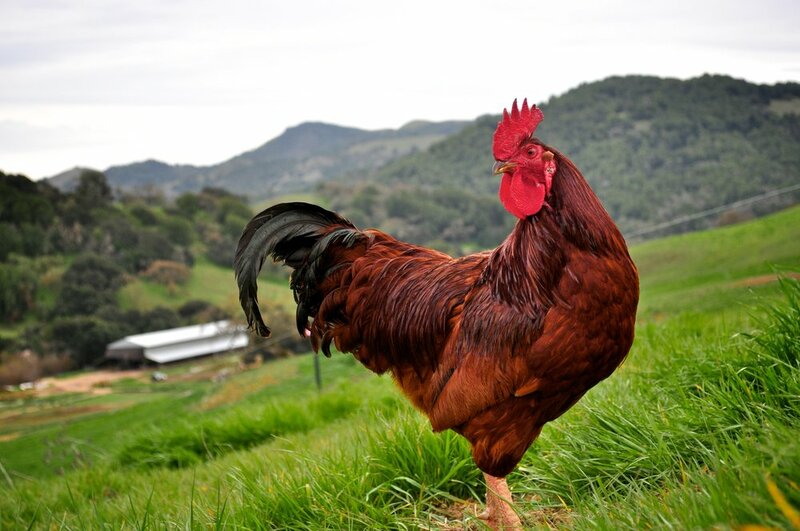 Tara Firma Farms keeps a flock of a couple hundred hens consisting of over 15 heritage breeds. These chickens produce eggs for us! Our mobile hen houses enable us to frequently move the flock to fresh swaths of pasture. This provides a diverse nutritious diet of insects, grubs, and grass, mimicking that of their ancestors, the red jungle fowl. This also allows the hens to thrive and produce eggs that are always rich in nutrients. Day old chicks arrive in the early morning hours and enjoy a warm cozy brooder with room to flit around and build leg muscle. At three weeks old they head out to the pasture to roam the fields all day while being safely tucked into a predator proof house at night. Omnivores themselves, they keep pastures clean of bugs, dig for worms, and will go after the occasional small rodent. This stress free management allows the chickens to never need antibiotics and is key to their overall health. Living its life as it was meant to, the chicken provides the soil with the needed fertilizer and food for humans that is healthy and tasty. They actually "taste like chicken"!